TheThe Toughest Toughest Carts Carts on the on the Planet. Planet. Specializing Specializing in in Exotic Exotic Customs. Customs. Finally, Finally, 30 30 tons tons of load of load capacity capacity with with realreal flare. flare. Introducing Introducing custom custom trucks trucks from from Hamilton. Hamilton. They They thrive thrive under under unconventional unconventional pressure. pressure. From From oversized oversized trucks trucks that that haul haul submarine submarine propellers propellers andand airplane airplane wings, wings, to smaller to smaller rigsrigs forfor toting toting race race carcar engines. engines. Red-hot Red-hot trim trim optional. optional. SeeSee ourour custom custom trucks trucks at CartsAndTrailers.com. at CartsAndTrailers.com. 2016 HamiltonCaster Caster & ÂŠÂŠ 2013 Hamilton & MFG. MFG. Co. Co.
SUBSCRIPTIONS: Third class subscriptions are free to qualified firms. First class: $89.95 per year. Foreign First Class: $415 Surface: $310 per year. Mexico and Canada Surface $145 Airmail $175. Single copies: $10.00 each. In the next issue ... Engaging your staff to promote productivity and efficiency. Cover Story consultant’s corps I hired Bob to do a series of seminars for the last company I ever worked for. He always does a great, great job. Bob does a great job analyzing numbers on dealer’s financials. He’s made Twenty-Groups popular and extremely effective. Bob and I have always been in sync on the department numbers and what they should tell a dealer. By the way, here is a prediction Bob made years ago - in the future, a minimum 50% of the equipment dealer’s employees will be technicians. It is not a guess any longer, the average dealer has surpassed that prediction. One thing I’ve never understood, he does great work on showing dealers the techniques of parts and service marketing. Throughout all my years I have stood fast on equipment dealers having an employee out in the field selling the dealership’s product support to the customer. Bob on the other hand tells anyone in the equipment business that it is all a waste of money and should be discontinued. The dealership in most of his cost of doing business studies in most industries is posting in service a 62% to 65%, but then check out their service contribution . . . it is in the single digits. Take a dealer principal through his descending sales reports and show him all the money he has left on the table. Caterpillar a few years ago claimed their dealers were leaving world-wide $18 billion in lost product support sales, which certainly is not chumpchange. Someday Bob, I hope we meet and you tell me why you are adverse to product support sales personnel. Please don’t tell me it is a job for the equipment sales person . . . Thank You, John R. Walker For your insightful Aftermarket column since 1995! Wishing you the Best of Luck in the Future! John Walker! Thank you does not express how we at Material Handling Wholesaler feel about the expert advise you have given our readers since 1995. From your thoughts on “market share” to “absorption rate” you made us think and laugh throughout the years especially when something struck a nerve. John, we wish you many years of relaxation with your family, great health and most of all we thank you for your loyal friendship through the last 21 years. Cover Story Dave’s operation manager. The three of us were seated in a fast food restaurant in a small South Eastern Ohio town when they convinced me to write, once a month, a four-page article which they would put in their monthly member’s magazine. Now, for a while all I could think about was facing a deadline every 30 days writing an article about something that had to do with the equipment dealer’s product support sales. I hesitated and kept turning them down. I just felt it would tie me down causing more problems than value, but at Dave and Bill’s persistence, I caved. And, I will tell you, my readers, it was one of the best moves I have ever made in my entire life. I have received business throughout the world. I have no worry about selecting topics because they will end up sending me their ideas for topics and I’ll build an article around their thinking. I was given the idea of writing this article by an association manager, who has been a great friend for years. This article ends up being #327 and that ladies and gentlemen is a whole lot of words. It has been a work of enjoyment and fortunately every now and then I’ll get an attaboy from someone out there. And, of course, nothing peps someone up any better than words like “Great article this month, keep up the good work!” Thanks, again Dave & Bill for not letting me talk myself out of writing all those articles. Dealers/Distributors, a few words of advice, a few important steps for you to take which should make your job not only easier, but much more profitable. You, your father and possibly your great grandfather probably went into business to serve the community and make an appropriate profit for your effort. “The Guru of Aftermarket Sales” Dear John, Thank you for highlighting the benefits of sales and profitability generated through aftermarket products such as ClearCap. We have greatly appreciated your columns and advice over the years. Best wishes, Steve Puls President Wy’East Products, Inc.
Cover Story and is looking for yet another 30 before the year is out. Funny thing is, I know he will find them because he does not sit around with the excuse that technicians are hard to find! Think positive, stop being reactive and become proactive! 4) Stop worrying about equipment market-share. Run a profitable dealership and the world will beat a path to your door. If you have to worry about the profit you gave up to sit at the president’s table on awards night in order to accept a glass globe, think about how unenjoyable that is and look elsewhere to support yourself and family. Well, someone has said this at some point in their life. I didn’t, nor will I take credit of this month’s article title: Thanks for the memories! I’ve enjoyed writing this. I like the editors who allow me the freedom to say what I feel. I like everyone out there in the equipment business, and for all these years have thought of you as the salt of this earth! THANKS FOR YOUR BUSINESS . . . If you ever want to reach me my phone number is (803) 548-6707 or (918)230-0791, John R. Walker, former President of AFTER MARKET SERVICES CONSULTING COMPANY, PO box 541, Ft. Mill, SC 29716-0541. John can be reached at amsconco@aol.com by email. I want to thank my customers for their support throughout the years. It has been a pleasure working with some top notch dealers throughout our great Country. Many of these dealers are great friends and I’ve enjoyed sharing my knowledge in aftermarket development for 37 years. Thank you for trusting me with your company and I also want to thank my Material Handling Wholesaler followers in reading my monthly column. Feel free to contact me if you have any questions or needing one of my manuals. Continuing the tradition NOTE FROM THE EDITOR: Today we say good-bye to a long-time friend and welcome a new Wholesaler columnist. As much as we have enjoyed reading John Walker’s columns over the years, and will certainly miss chatting with him each month, we have to celebrate along with him that he has reached that milestone we all envy – retirement. which for decades depended on the “better mousetrap”, must now evolve to include new and previously untapped sources of income. Differentiation that builds value is now much less tied to the “equipment” and more realistically tethered to the support capabilities of the dealership. In the few shorts years that I’ve been editor for Wholesaler, I’ve quickly learned that John Walker is a very well-respected icon in the aftermarket sector of the material handling industry. We know that readers looked forward to his column each month and were happy for a chance to meet him at the industry shows. As late as the mid 1980’s, the thought of having a “second” sales crew to “sell” parts and service seemed like a ludicrous waste of money. Dealers bristled at the notion that this function of the dealership would have to be managed and cultivated. “Doesn’t this happen on its own? If they buy our truck, don’t they have to buy our parts?” The answers seem self-evident today. Few if any dealers in today’s marketplace don’t have some form of aftermarket sales effort at work inside their company. 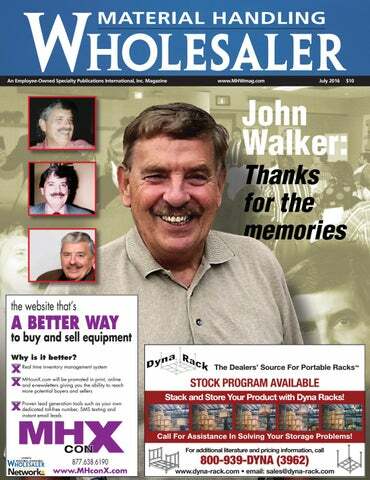 All of us at Material Handling Wholesaler want to thank John Walker for his expert advice and friendship for the last 21 years in writing the Aftermarket column. We also want to introduce to our readership the new aftermarket columnist Dave Baiocchi. He has spent 33 years in the equipment business as a sales manager, aftermarket director and dealer principal. Dave now consults with dealerships nationwide to establish and enhance best practices, especially in the area of aftermarket development and performance. Dave started his career at Peterson Power Systems, a Caterpillar dealer in San Leandro, CA in sales. After six years he was promoted to Rental Fleet and Used Equipment Manager. He then moved his family to join the leadership at J.M. Equipment Company who represented Nissan and Barrett Forklift Trucks. Dave worked there as the General Sales Manager and developed both machinery and aftermarket salespeople into an award winning sales team. In 1999, he and five other key employees partnered to purchase J.M. Equipment in which he became president of the material handling division. Under Dave’s management they were repeatedly awarded the “Nissan Nine” designation, highlighting the top nine dealers in the country. In 2005, he shifted responsibilities from equipment sales to aftermarket support and marketing. Dave was awarded the “Nissan Pinnacle” award for lifetime achievement efforts in both sales management and aftermarket development. Dave has served on several executive boards and committees during his tenure in the material handling industry, including being a member of the OEM dealer advisory councils for both sales and aftermarket. He has been a featured speaker at MHEDA conferences and MHEDA events at his dealership. In 2013, Dave started Resonant Dealer Services LLC, as a platform to share ideas with others in new and expanding ways. Dave will be taking the reins of the Material Handling Wholesaler “Aftermarket” column from John Walker. The staff of Material Handling Wholesaler wants to welcome Dave to our family and look forward to having Dave carry on the tradition of writing informative aftermarket monthly articles to make our dealer/distributor readership even more successful in their companies. dealership. I have worked as a commission salesman (yes I was a hunter at one time), a rental manager, a used equipment manager, a general sales manager, an aftermarket director and a dealer principal. I have had a 360 degree view of this business over the past 33 years. Of all the challenges inside the dealership, shifting the culture and the perspective of ownership groups toward the importance of their aftermarket business is by far the most difficult task I have encountered. We are still very “equipment-centric” in this industry. But we are making progress. MHW magazine has asked me to share with you some of the programs and policies that I have developed over the years to assist other dealers in making these important transitions. I look forward to having this opportunity to offer ideas that will help our industry move forward. In regard to John Walker, I can only say that those shoes will feel mighty sloppy on my feet. I will do my best however to add to the legacy of aftermarket excellence that he has so capably built over the years. Enjoy retirement John…yes I am envious….and yes, you certainly have earned it! Dave Baiocchi is the president of Resonant Dealer Services LLC. He has spent 33 years in the equipment business as a sales manager, aftermarket director and dealer principal. Dave now consults with dealerships nationwide to establish and enhance best practices, especially in the area of aftermarket development and performance. E-mail editorial@mhwmag.com to contact Dave. With theWith company’s the company’s 30th Anniversary 30th Anniversary this year this it was year time it was to celebrate. time to celebrate. So we have So we decided have to decided give one to give luckyone winner lucky every winner month everyamonth limiteda limited edition Chain edition Wear Chain Gauge! WearVisit Gauge! www.chainweargauge.com/mhwmag Visit www.chainweargauge.com/mhwmag and and enter your enter details your fordetails a chance for atochance win. to win. The FB chain The FB wear chain gauge wear enables gaugeyou enables to track you chain to track wear chain at each wearservice at each service and takeand any take necessary any necessary action. action. The FB gauge The FBwill gauge provide will consistency provide consistency across your across whole yourservice wholeteam. service team. The gauge Thealerts gauge you alerts to chains you tothat chains could that becould dangerously be dangerously worn-outworn-out before the before next the service. next service. Four issues that impact your business Times continue to change....which is an on-going process. I happen to study both international as well as US economics and find myself amazed every week because of some change that is disrupting a market or industry. Look how our “new” oil industry both emerged and disappeared in not too many years. See how Amazon is impacting the retail industry. And who would have thought that they would ever see ZERO interest rates for as long as we have. In the end, today’s business world is a tough place to be. At first glance a reader will read the four issues and conclude he/she does not have the time nor finances to implement a program that could properly address these issues. My response would be to outline a plan, set the goals for five years out, make the players accountable and use all the resources you have available to assist with both the planning and implementation of the plan. So if constant change is upon us, what exactly are the issues for material handling dealers? I will list four that I believe are important. You have to know the industry....how it works....how it is financed.....and how it generates positive cash flow. And there are many sources to help you learn about the industry, where it has been and where it is going. You can get information from OEM’s, industry associations, industry publications (like this one), 20 Group participation, industry system providers, conventions, on-line courses and other experts with knowledge to fill in the gaps where you need guidance. To summarize, you can cut to the chase and get input and answers from industry people with minimum effort. 1. Technology adoption = success 2. Equipment improvements 3. Data management 4. Education....Education....Education All of these are important and warrant some management time to draft a plan to address these issues, along with other industry matters, with a goal to keep your company on the LEADING EDGE of the material handling distribution cycle. Once you get up to speed it will be easier to plan out where you want to be five years out and what you need to do to get there. Technology is next The use of technology in the material handling business is gaining momentum, but I must confess that employees under 30 are probably the best source of expertise when it comes to adopting new technology and making use of what you have already. Your business system should be industry specific and the provider should be pestered to make your staff aware of ALL the features you need to provide above average customer service. The equipment keeps getting better. Technology applied to equipment use is getting more available. It is getting better.... requires less maintenance......lower cost to own and operate. If the new Tesla battery technology makes it to the lift truck circuit .... we have a new major disruption on our hands. Not only do you need to know your system, but also those apps on the tablets, phones and laptops. And probably the most important thing is to have an under 30 team charged with keeping systems updated and ALL employees trained to use the equipment at least at an 85% efficiency rate. Data management goes along with technology. We have tracking data. We have telematics. We have training data to make repairs easier to complete. Our problem of course is how to receive and decipher the data we get. My solution to this is to work with your OEM or dealer to help you monitor and review data so that you can prioritize work that needs to be done to keep customers close to 100% up-time. There are many technology experts out there. Maybe there is one living in your basement because their college degree has not produced a job. Part-time or full-time they can be had for not a lot of money. In addition, they may like what they see and you can spend some of your education money on them and wind up with a tax-paying member of society on your payroll. One thing is for certain re technology.....every employee has to remain current regarding the use of the company’s technology. No excuses allowed. In the end, I believe a dealer can deal with these four issues with a modest investment in education, using an industry specific system, using the OEM to keep up to date with equipment changes and using our under 30 group to implement and monitor digital issues. Prepare the plan, set the goals, assign responsibility and inspect to ensure you are getting what you expect. Mastering these four issues = success and future profitability. Garry Bartecki is a CPA MBA with GB Financial Services LLC. E-mail editorial@mhwmag.com to contact Garry. New & Used The Ecopoint charger from Ecotec is a full featured industrial battery charger available in 2 models for 8 hr. and 10 hr. recharge. The standard ECO-250 control offers data management normally found only in much more expensive chargers. For pallet jacks, consider the fully automatic STC taper charger. Plugs into any 120V outlet for convenience and portability. For the ultimate in efficiency and flexibility, consider the Access high frequency charger. Models are available for both conventional and opportunity charging. Win a limited edition chain wear gauge Material Handling Wholesaler and FB Chain will be giving away 30th Special Edition anniversary Chain Wear Gauges to five Wholesaler readers to celebrate their 30th anniversary All you have to do is register now through August 31st at www.chainweargauge.com/ mhwmag. That’s it. This limited edition gauge enables you to track chain wear at each service and take the necessary action. Register to win today! No purchase is necessary to enter. 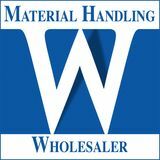 Winners will be announced in the October issue of Material Handling Wholesaler. Building a gold medal-winning team With the 2016 Rio Olympics fast approaching, top athletes from around the globe are vying for the final few spots available to represent their respective countries at the games. To make it this far, each contestant has had to take a single-minded approach to maximizing his or her personal performance potential and has pushed him or herself to be the best of the best. For a nation’s Olympic committee, however, the question is not always “Who is the best individual performer?” but “Which group of individual performers will make the best team?” As a business leader, this is a question you may ask yourself in a work context. An important part of team building is, of course, knowing the team’s objective, whether it’s winning a gold medal or grabbing a larger percentage of market share. But it’s also important to know what type of team you are building as well as what components are needed for the team to be successful. Take the baton relay in track and field, for instance. Only one team member performs at a time. Each individual must bring speed and stamina, but the critical team component is timing. If that baton hand-off goes awry, it doesn’t matter how fast each team member can run as an individual. Meanwhile, volleyball requires flawless synchronization of motion, with six athletes each in perfect position to support the player in front of, to the side, or behind her. In gymnastics, on the other hand, each member brings a different specialty to the team, and the entire group succeeds through a collective of strong personal performances. The parallels to teamwork in business should be apparent. For a company that deals in industrial or warehousing systems, an Outside Sales Rep may carry the baton on the first leg of the relay, the Sales Engineer on the second, the Installation Project Manager on the third, and the Account Manager on the final leg. A restaurant might be more like the volleyball team, with tables being cleaned, guests seated, orders taken, meals prepared and delivered, credit cards run, and back to tables being cleared, all while supplies continue to arrive and kitchens are kept clean. With the wrong group of people in place, service and food quality go downhill fast. Numbers and science are essential to building an Olympic team, from initial qualifying times to complex metrics that determine who would be best at running a given leg of a race, just as they are in supporting effective teamwork in business. About Caliper - For nearly half a century, Caliper has been helping companies achieve peak performance by advising them on hiring the right people, managing individuals most effectively and developing productive teams. The accuracy, objectivity and depth of our consulting approach enable us to provide solutions that work for over 25,000 companies. To find out more about how Caliper can help you identify and develop people who can lead your organization to peak performance, please visit us at www.calipercorp.com or call us at 609-524-1200. Email editorial@mhwmag.com to contact Caliper. Today’s warehouse fire protection systems include more than just pipes and sprinklers. When the products being stored include highly flammable items such as plastics, aerosols, liquors or oils, fire baffles may be required inside the racking structure. Solid steel rack decking and flat sheet accessories from DACS make effective fire or heat baffles in warehouse environments. They can be used on storage racks horizontally or vertically to block the spread of fire, or to capture heat for in-rack sprinkler activation. TWO days later, I got an email from a rep with another property. It was pretty much a template with attachments of brochures for several of their properties. None of which came close to the criteria I very clearly stated in my inquiry. It was obvious she paid no attention to what I specifically said I needed. In the canned email she wrote that she’d like to set a time for me to come by one of her properties and learn what my requirements were. Really. On the third day after filling out the forms, I got another templated email from a corporate property management office, thanking me for my interest, with links to their various properties, and asking me to fill out a form on their site that asked about my requirements. Seriously. You can’t make this stuff up. Also on the third day, one rep sent an email saying that he didn’t have exactly what I was looking for, but sent me information on something that was close, but still bigger and more expensive than what I needed. He actually READ what I filled out. Woo-hoo! The ONLY call I got from these forms was FIVE days afterwards. From a local rep from the corporate management company I mentioned earlier. I asked him why he didn’t call sooner. He dejectedly admitted that he just got the lead, and that’s the way they work. Again. Amazing. Oh, I did get a call the first day I filled out the forms. I had also placed an ad on Craigslist in the Property category, also with my very specific criteria. The call came within an hour of the ad going live online. It was from a building owner who had space that was bigger and more expensive than I needed. I thanked him for the call, and he said, “Why don’t you take a look at some pictures, and if it looks good we can talk about price later.” Nice. He sent the pics, I liked the space. A lot. He called back an hour later. Now I’m getting interested. I told him it was still more than I was looking to pay since I wasn’t looking for something that big. He said he was motivated to just get someone in there. Not a great negotiating tactic. But read on. I went to look at it. He knew I wouldn’t take the time to do that if I wasn’t somewhat serious myself. Bottom line, he dropped his price. Not to what I originally wanted to pay, but I was willing to come up since I loved the space. Lots of sales lessons here: - A lead is like a burning match. The fire (interest and opportunity) will go out quickly. Jump on them as soon as you see them. - One person who is motivated, and cares, can outsell a mammoth corporation with inefficient impersonal systems and employees who are just collecting a paycheck. - Despite someone saying your price is outside of their budget, keep in mind that a budget is usually just an adjustable nebulous thing. And there almost always is someone who can make a decision to go outside of it, IF they see a reason to do so. -What someone really WANTS will override what someone thinks they just need. Find out what that is and you will find your selling is easier. Make it your best week ever!! Art Sobczak helps sales pros prospect, sell and service accounts more effectively by using conversationally, non-sales messaging, and without “rejection.” Get a free ebook of 501 telephone sales tips at businessbyphone.com/501-tips-ebook. Email editorial @mhwmag.com to contact Art. It’s the fast & easy way to learn more about specific equipment. ✓ Professional Staff ready to help answer questions, fast quoting service and the know-how to get the job done right the first time. Humble beginnings lead to 40 years of success for MII Equipment It was a beginning in humble accommodations infused with entrepreneurial spirit. Four decades ago, Jim Hunter launched MII Equipment Inc. in borrowed space, actually, a restroom converted to an office. “He loves to tell that story,” said Dean Johnson, MII Equipment executive vice president, of Hunter’s tale of the business launch. Hunter began the business as a manufacturer’s representative to three primary products lines; national manufacturers of pallet jackets, ergonomic equipment and dock and protective equipment. “His vision at that time was to provide material handling, dock equipment, floor mounted safety products and ergonomic equipment to the industrial customers throughout the Midwest,” said the company’s online history. Nest them or stack them! “As MII Equipment grew, it became evident that a broader line of products was needed to supply customers throughout the U.S.,” the site said. Bolstered by Hunter’s entrepreneurial enthusiasm, MII later transformed to include stocking representative, and later, master distributor. In 2000, the company had the opportunity to establish its own brand and did so with the launch of Handle-It product lines replicating the three original lines the company served, according to Johnson. MII president Hunter’s background in business, engineering and material handling helped him create products that filled in the gaps in MII’s line of products, the company history said. Today, Handle-It is a global source of products, with stretch-wrap machines being a key area of growth, according to Johnson. MII operates out of Milwaukee with about 22 employees in a 22,000-squarefoot warehousing and manufacturing facility, serving clients across the U.S. The majority of manufacturing takes place at locations in Wisconsin, China and India. Available in 9 sizes and 4 colors! Akro-Mils' Nest & Stack Totes are your ideal containers for shipping, transfer and storage! These durable, industrial-grade totes have textured bottoms for a no-slip grip on conveyor belts. Ribs under the lip prevent jamming when nested. A wide stacking ledge allows totes to be securely stacked with or without lids in place. To find out more about these versatile plastic containers, visit us online at akro-mils.com! “Handle-Its’ focus remains on offering a competitively priced, high-quality product to the market place,” the business website said. Products offered include: guard rails, rack protectors, post protectors, overhead door track guards, dock plates and boards, edge of dock levelers, pit levelers, scissor lifts, tilters, pallet trucks. In addition to the current line of products, the company said it continues to expand those lines and offer custom engineered solutions to customer’s specific application needs. The 40th anniversary of the business has received little fanfare at MII, where Johnson said the “nose to the grindstone” efforts of the work force are allowing the anniversary to fly by relatively unnoticed. “The most important milestones are the success of the business,” he added. Looking ahead, company leaders are considering an expansion to include a California-based warehousing operation, to ease transport capabilities throughout the West Coast. Impact protection equipment remains the key offering at MII. Johnson added that plastic impact equipment may offer future growth opportunities. Building and maintaining relationships with customers is a pivotal component of MII’s operation, according to Johnson, who said MII is known for its responsiveness and versatility in its assistance to clients. “Customer service is the focus of what we try to do,” he said. Industrial Forklift Batteries and Chargers In Good Condition!! Call Us With Your Off-Lease Or Fleet Surplus Equipment. Suffering from LWD? (Load Wheel Dysfunction) We have the cure! Contact AVT for a better, longer–lasting, more satisfying load wheel experience. Put that smile back on your operator’s face! Our polyurethane wheels and tires resist premature failure and add longevity to reduce down time. Whether you’re moving slow under a heavy load or you’re a high–speed specialist, we’ve got your wheel. Increase your productivity today! We invite you to JOIN THE LEADER! TVHTVH is the worldwide leading supplier of quality replacement parts andand is the worldwide leading supplier of quality replacement parts accessories for the material handling and industrial equipment industry. accessories for the material handling and industrial equipment industry. With ourour 10 distribution centers across North andand South America, we we are are With 10 distribution centers across North South America, ableable to reach 90%90% of the industrial equipment population in 1inday to reach of the industrial equipment population 1 day ground service with over 7.5 7.5 million parts. ground service with over million parts.